At Brown’s Shoe Fit Great Bend, we aim to please! 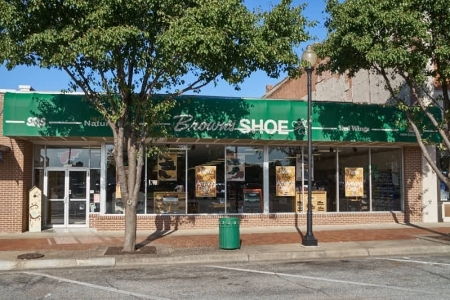 We carry many name brand shoes for men, ladies and children including casual, dress, work boots, and athletic shoes in many sizes and widths. “Shoes with comfort and fit or the entire family,” as we like to say. We’re a large supplier of work boots from Red Wing, Danner, and Keen to agricultural, manufacturing, oil, and gas industries. Steel, composite, and soft toe boots are available in a variety of sizes and widths to fit you. As always, we want to make certain that you are happy with any footwear purchase. If we don’t have just what you’re looking for, we will gladly special order any shoes we do not have already available in our store inventory. Special orders are welcome and at no additional cost to the customer. We’re proud to have been a member of the business community in Great Bend since 1963 and we look forward to serving you when you need your next pair of comfortable shoes. Come see us on the West side of the square in downtown Great Bend! There are no reviews yet for Brown's Shoe Fit Great Bend.